So thanks for baring with me… at least there were lots of photos to look at. 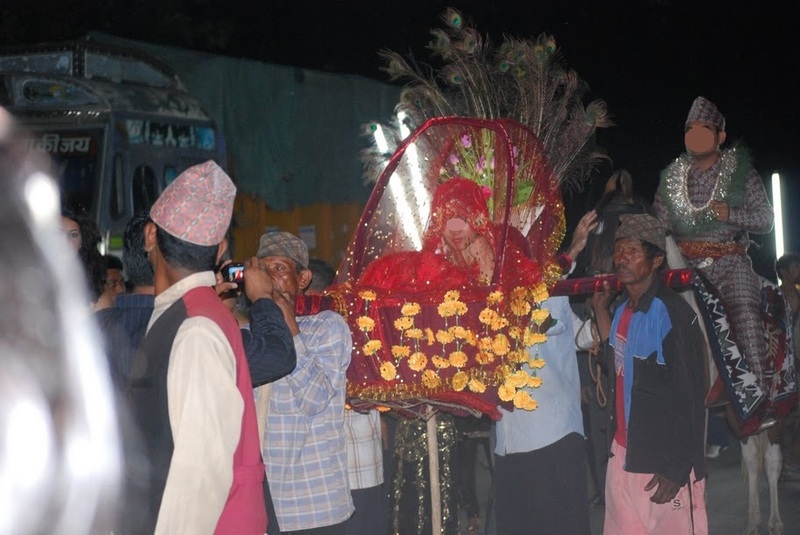 This final ceremony, the Mukh Herne, is specifically a Newari tradition. 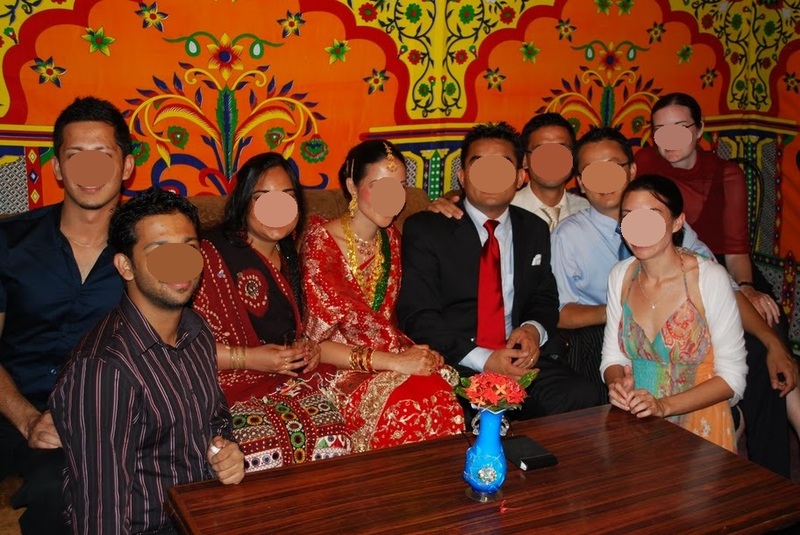 Mukh Herne literally means “face looking” and it was explained to me that after the bride spends a few days with the groom’s family she is brought back to her relatives so they can “look at her face” and see if she is happy and being treated well. 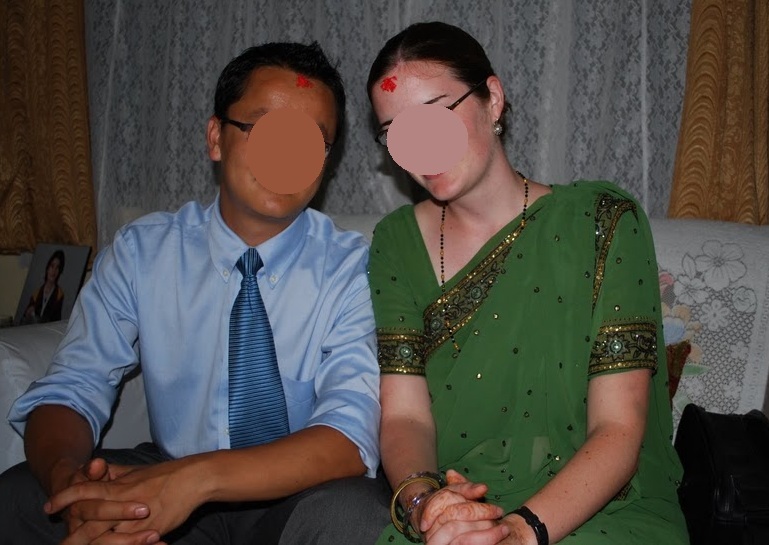 For R it started back in Chitwan, where S’s family made sure she was looking great, including an elaborate hair style. So remember the pile of gifts that the groom’s family brought to the bride’s family during the Supari? 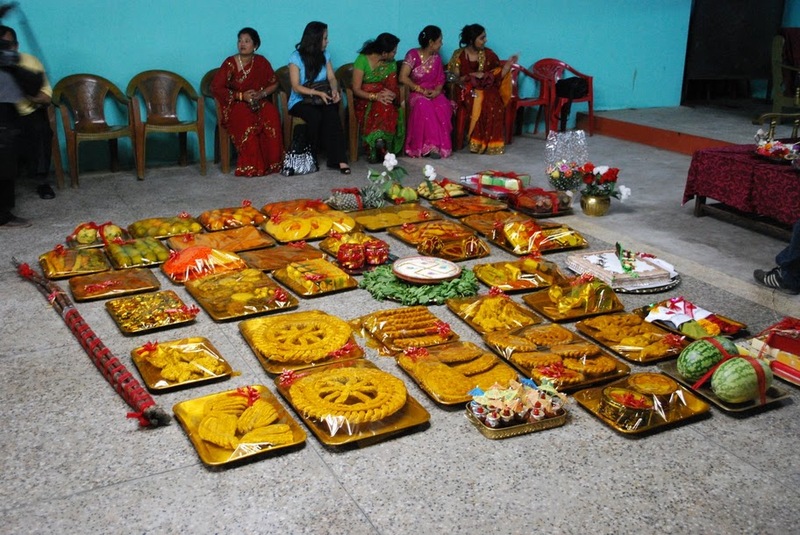 The bride’s family reciprocated by adding more gifts to the pile and displaying them during the Mukh Herne. During the reception many of the edible gifts were distributed to the guests as sweets but other gifts like cosmetics, purses, clothing, etc, were brought back to the groom’s home. One of the more creative gifts came from R's brother. Inspired by sets of tee shirts that S brought from the US as a funny treat for their families with different logos printed on them (like a tee shirt for R's brother that said, "I love my new brother-in-law"), R's brother dressed two fish in mini "I love" shirts. 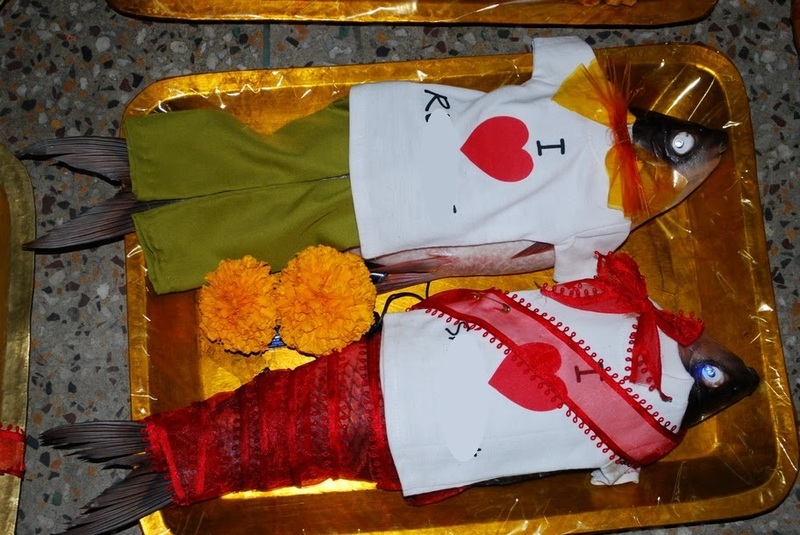 The fish wearing pants has a shirt that says "I love R" and the fish in a red sari says "I love S."
Similar to the other receptions, the bride and groom had a special place to sit where family and friends greeted them and offered gifts. At some point during the ceremony, R changed from the clothes given by S’s family to a set given by her own family. 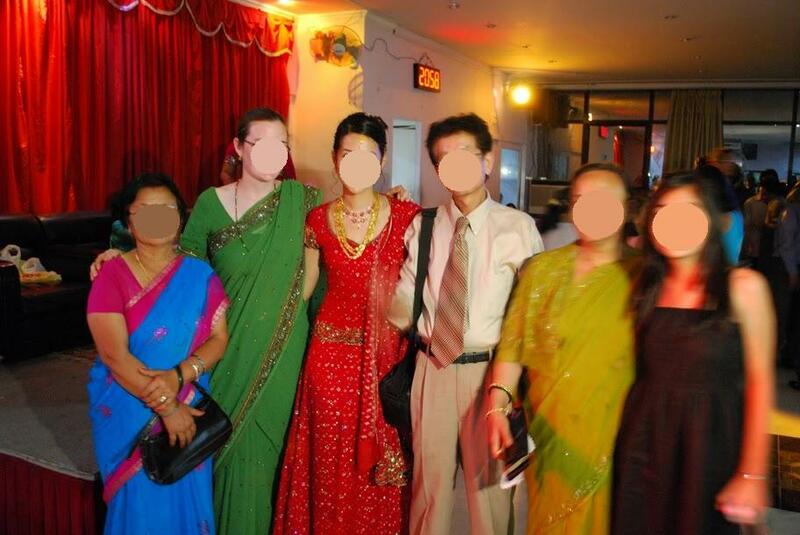 The second part of the evening occured after the reception when the groom (and the groom’s friends) returned to the bride’s house to be officially welcomed as a “jwai”– a son-in-law. Supposedly the groom’s friends are usually teased by the bride’s family, but I think by this point we were well loved by R’s household. S was greeted and introduced to each member of R’s extended household individually (even though by now they already also knew him), and each gave him a monetary gift and blessings, which he touched to his head and receive tikka. As S’s “groom representatives” we were also given gifts by R’s mom and dad. The very very last step in this process was symbolically sharing a meal with R’s family (Sagun)… we were given eggs, rice, roti, and different curries to try. At the end of the evening R and S’s wedding had officially concluded. Slowly, afterward, R was able to start wearing colors other than red. Phew… what a journey! 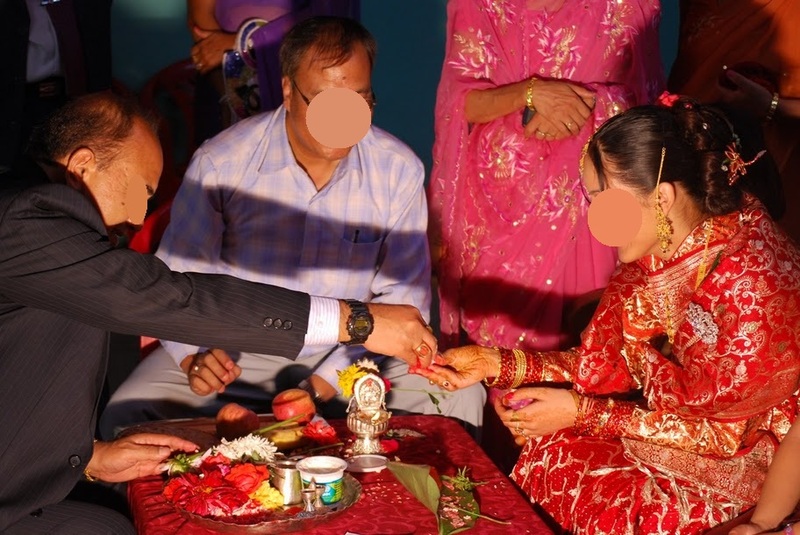 After the Swayambar, it is time for the wedding ceremonies to shift from the bride’s side to the groom’s side. 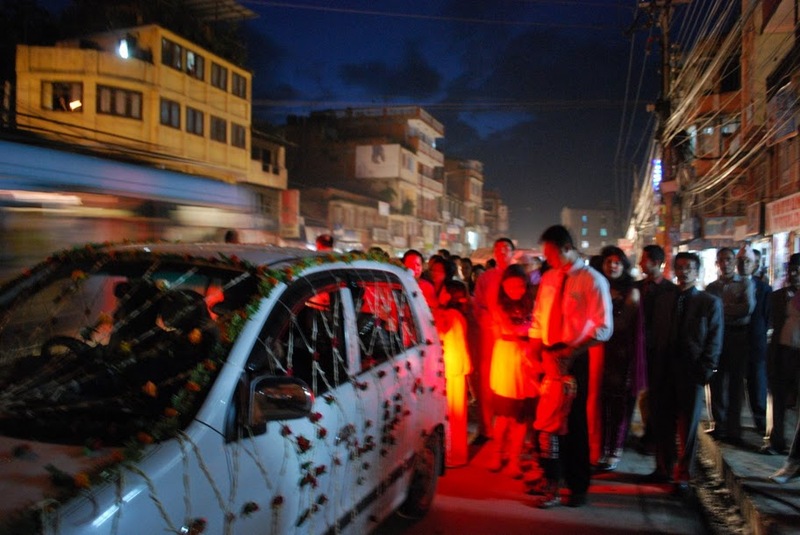 This shift starts with the “pita biee” (in Newari) or Bidaai– saying goodbye to the bride. This is quite an emotional ceremony (especially when everyone is exhausted because they had two hours sleep after a nearly all night wedding program), because traditionally this is the last time the bride is at her house as a regular member of the household and not as a wife visiting from another home. R still manages to be beautiful despite her undoubted exhaustion. I guess it makes it easier to look sad and serious. Near the end of the Bidaai the bride is led by her family to the groom's awaiting entourage. Tears flow freely. Here R is hugging her brother good bye, while her tearful mother leads her to the car's open door. 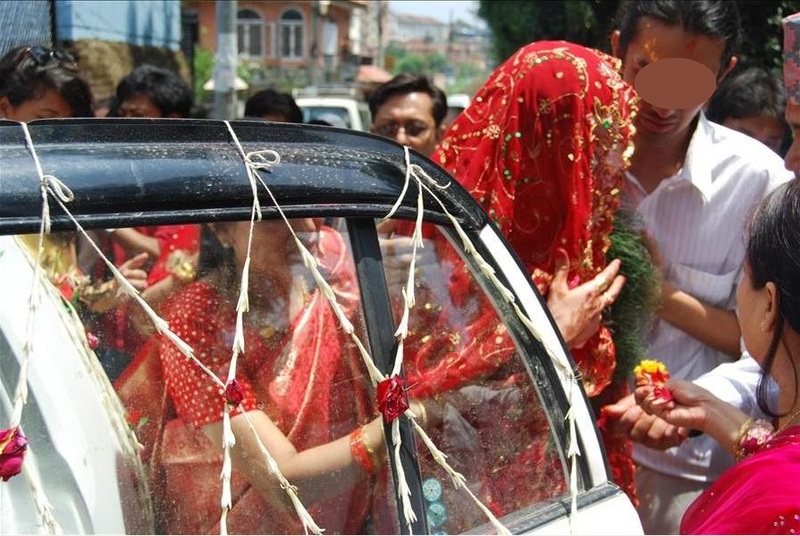 I jumped in the car with the bride and groom and was given the job of protecting the bride’s new wedding jewelry in a little case from “bandits” we might encounter on the winding road between Kathmandu and Chitwan. S laughed it off, saying that Kathmandu-ites don’t know what life outside the valley is like, but I made sure to keep the wedding bling close at hand along the route. A little more than halfway through our journey the wedding entourage stopped for refreshments. Even though the monsoon rains had started right before the wedding began (bringing a bit of relief from the sweltering heat of the pre-monsoon summer), Chitwan is known for its heat (hence my shorter dress, rather than longer sari–poor mzungu). 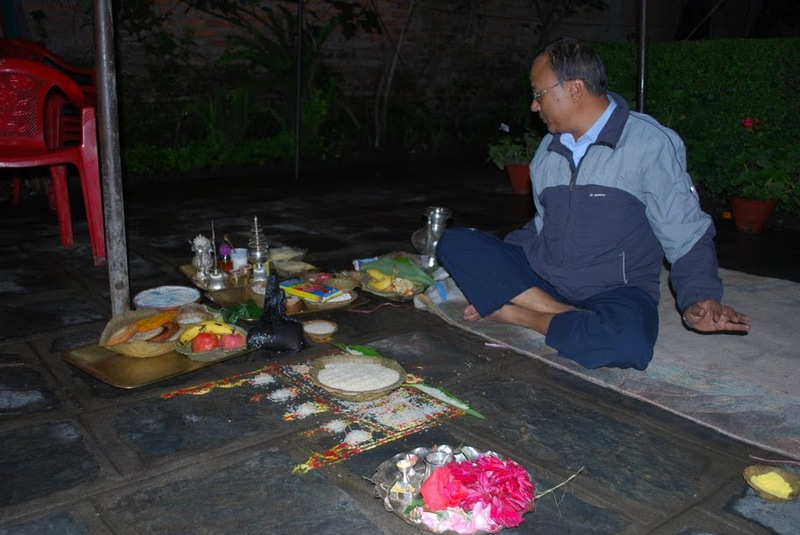 Once we arrived in Chitwan the janthi (return of the janthi!) started to gather at S’s old elementary school on the outskirts of town. Those of us who participated in the original janthi were joined by legions of S’s relatives, neighbors and family friends who couldn’t make the trip to KTM. As the janthi time approached we swelled to quite the crowd. S triumphantly returned to his home city atop a regal horse, while R was loaded into the flower draped basket from which S originally departed the city, and was carried along the janthi procession. The marching band (with the long round horns) led the way. S assured us that Chitwan was much cooler since the rain had come than it had been before (during his own wedding prep time), but it was still unbearably hot and humid. As part of a massive, dancing, pulsing crowd, our sweaty bodies squeezed together in the celebratory chaos, the temperature was suffocating– but it didn’t stop the revelry. Some of S’s uncles bought cold beers to pass along the janthi procession to refresh the crowd while the city seemed to stop and watch the entertainment of our entourage. One of the most interesting aspects of the procession was the ingenuity of the lighting. 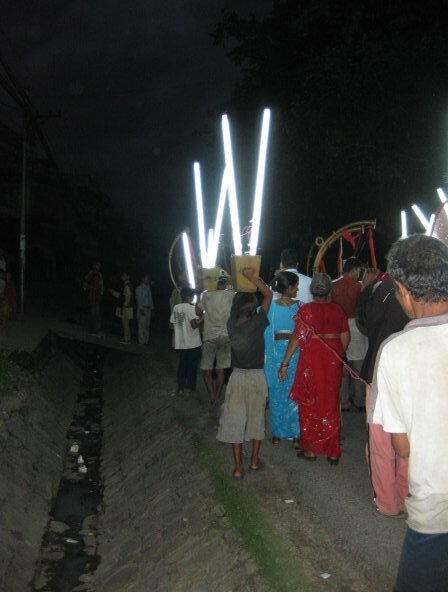 Since there wasn’t proper street lighting, the procession was lit by electric tube lights strung together and held atop people’s heads in wooden boxes, and powered by a wagon drawn generator. I was told that the procession wasn’t so far… only a kilometer or two, but if that was the case, it was one of the longest kilometers of my life. The entourage processed slowly. Every time one of us tried to break to the front of the janthi for a breath of fresh air one of S’s uncles would tell us to walk slower, dance more, so that the janthi had more time to celebrate and clog the streets before arriving at S’s family home. As we approached, S’s mother (seeing the wedding procession for the first time) meet the janthi party outside the front door holding a lantern and a metal platter with welcoming prasad. R’s basket was placed on the ground and S’s mother waved the platter in front of R in a gesture of welcoming, helped R out of the basket, and gestured for her to go inside. It was all pretty remarkable. It struck me how nerve wracking the experience could be. R had the advantage of knowing S’s immediate family quite well, and she had friends (us!) 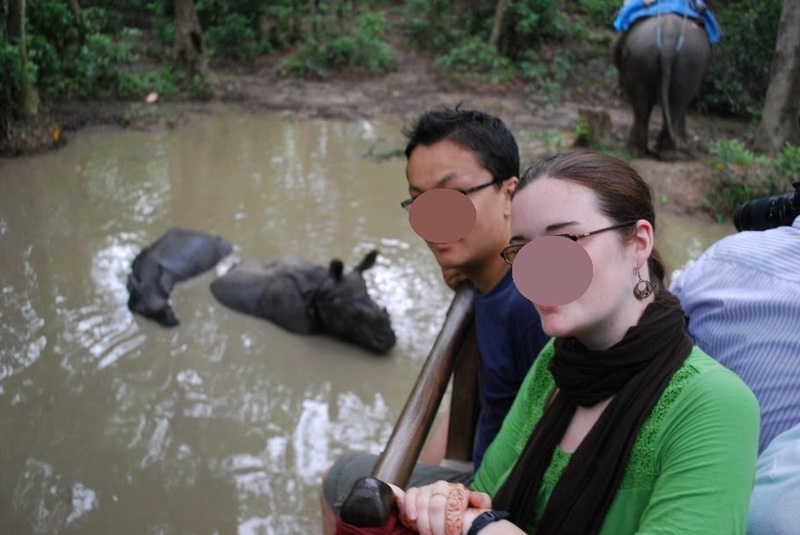 along for the ride, but everything else was new– new city (she had never been to Chitwan before), a sea of new faces, new relatives, new family traditions. Not to mention she was probably utterly (utterly!) exhausted by this point. I couldn’t help but think, wow, how brave. We were such good friends, that we abandoned the couple for the next 12 hours. The group of us (from the picture above) headed to Chitwan National Park to go on an early morning elephant safari and see some wild rhinos. 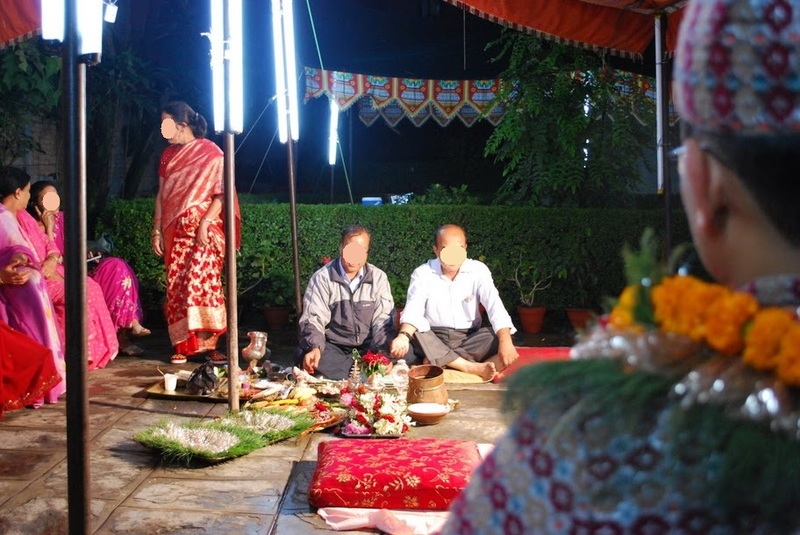 While we were gone on safari, the wedding rituals for the new couple continued with early morning pujas at the temple. 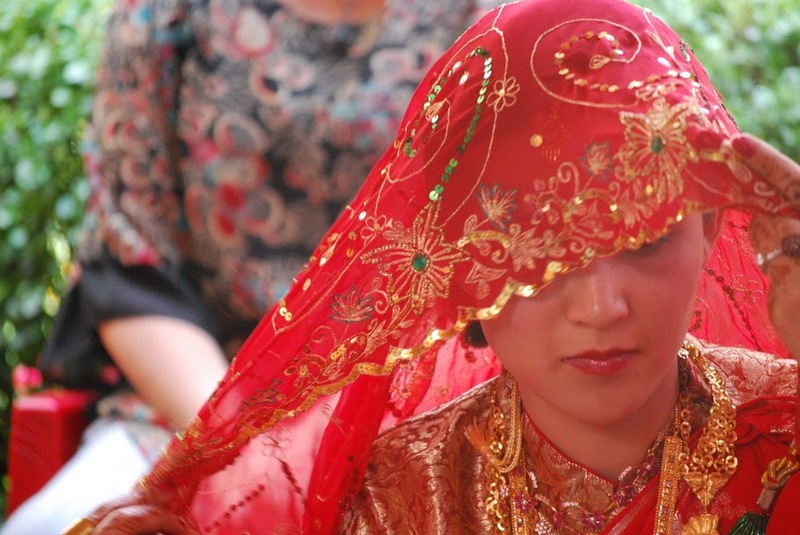 Remember… it’s ungodly hot, but as per tradition, the new bride has to wear the groom’s family’s clothing (that they purchased for her), and new brides are supposed to be kept covered–meaning long sleeves and shawls. Poor R was boiling. At his family temple, S again ritually applies sindoor to R's scalp, this time in S's family's style... one end of the white cloth is touching a god, the other end touching R's forehead. S sprinkled sindoor powder from the god, across the white cloth up to R's forehead. S's mom, pointing at the cloth, explains the procedure. At last, the groom’s reception. Being the chivalrous guy that he is, S spoke up to his family about R wearing the heavy long sleeved wedding sari in the heat. The family compromised, R could wear her family’s lighter weight sari if she wore a shawl with it. and Family. 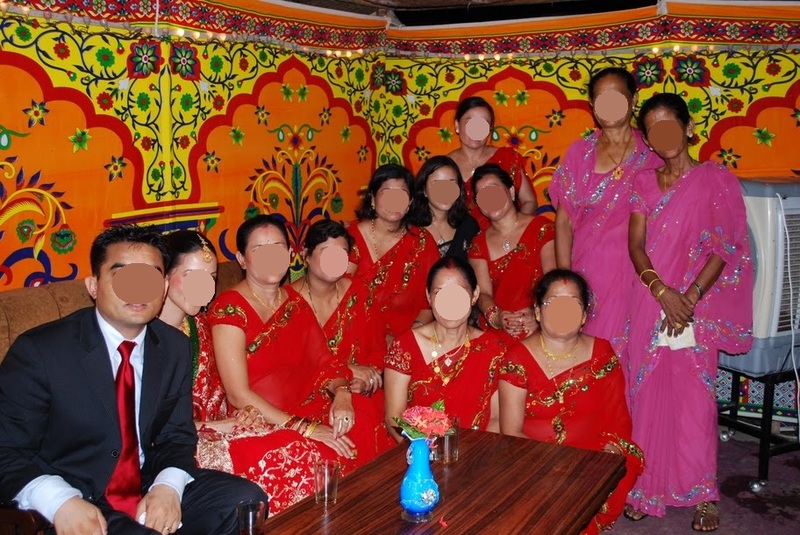 The groom's family gifts matching saris to all the women in the janthi-- so all the family members have the same look. 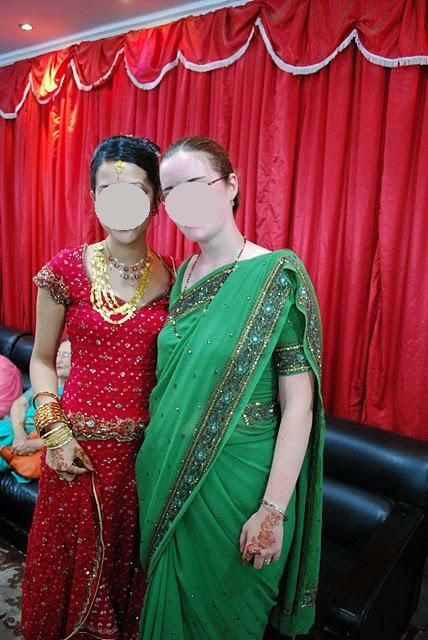 Even though I was part of the janthi, I cheated, and S bought me a sari of my choosing (the green one). After three days in Chitwan, it was time to leave. R had to settle into her new “home” (although, in name only since she lives in the US) and get to know her new extended relatives. P, myself and the others journeyed back on the four hour long winding road up into the hills and into the KTM valley. 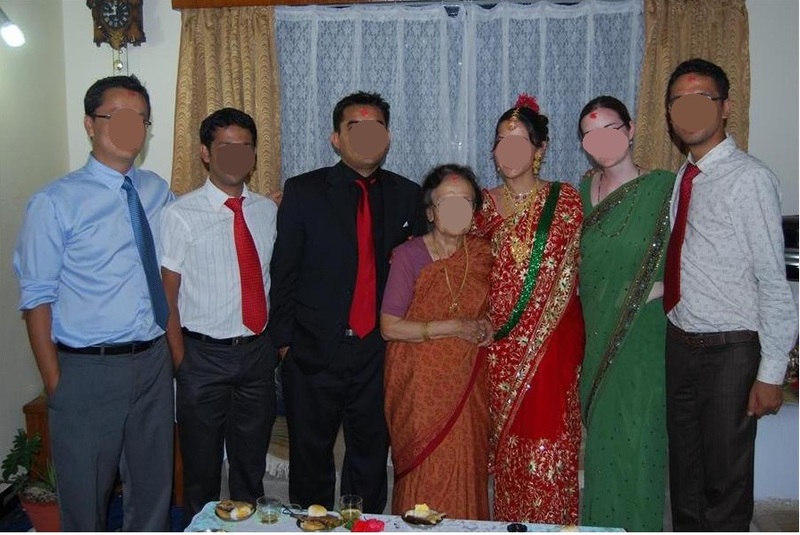 Only one major wedding ritual left… Mukh Herne. The bride approaches, flanked by her aunties and cousins. 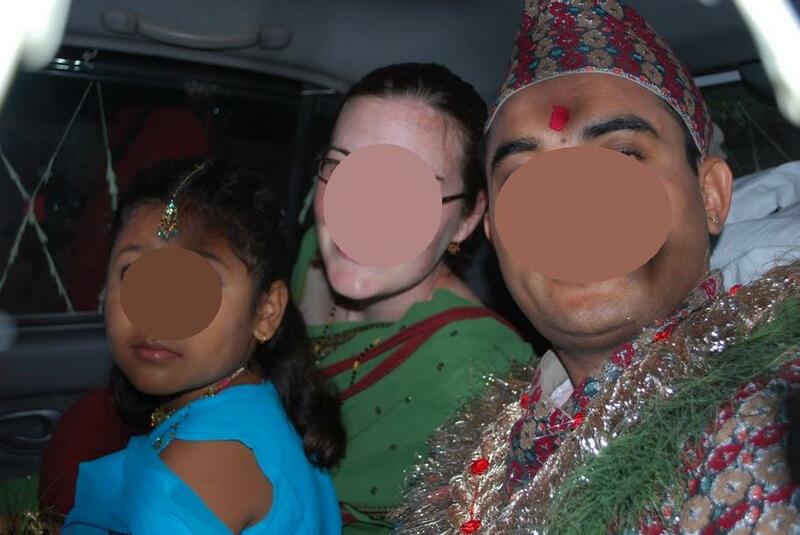 One thing I want to mention specifically… brides are not supposed to look happy during the wedding (even if they are) because traditionally they were leaving their homes for good, and moving in with a groom and a new family that she might not know so well. Its more common for the bride to look sad, or to cry. However R has a very happy, bubbly personality, and I think it was really hard for her to keep looking serious. Whenever she posed for pictures her younger brother would gently tease her, “Hey R! Look down! Look sad!” I think it is nicer for the bride to smile… especially if she is happy. I’ve seen plenty of Nepali wedding photos were the brides look miserable (even if they aren’t) because that is what is expected. R might have struggled even more to look less happy to be marrying S if it wasn’t 2 o’clock in the morning and several days into an already busy wedding schedule. I think the bride and groom were already thoroughly exhausted. And they sit and listen to the priest, following instructions for all the small details whispered from both R and S's aunties. There was a lot of picking up flowers and rice and fruits and touching them to their foreheads, or throwing them into a candle flame, etc. Now the key part begins, remember the sindoor given during the supari ceremony? S used the same sindoor powder to sprinkle on the part in R’s hair. 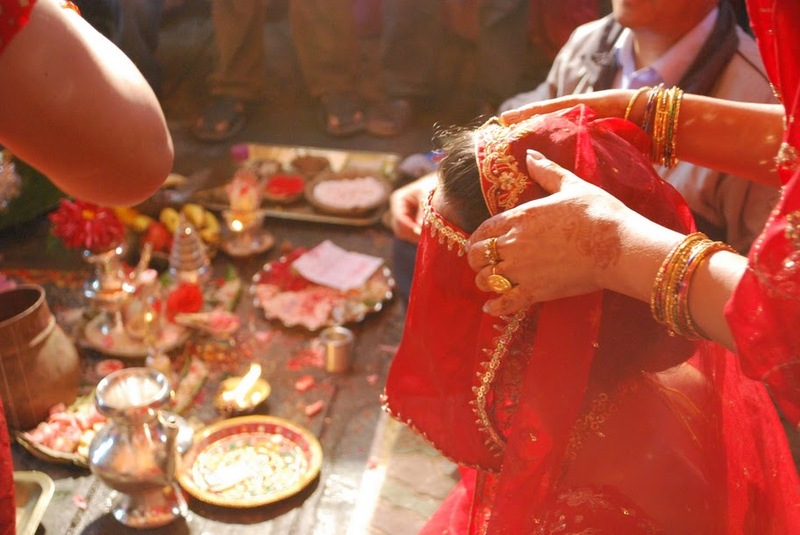 The bride’s face is hidden by a handkerchief as the groom applies the powder, after which the couple is considered married. I liken this to the exchange of rings in Western culture. Two angle shots of S applying R's sindoor, flanked by relatives telling him what to do and where. Exchanging the rest of the wedding paraphernalia, from left to right by row starting with the top: R receives a grass garland, then a flower garland, then a ring (since Nepali culture doesn’t really have the same wedding ring significance like western culture, S gave R back her western style engagement ring), then R gets some gold wedding jewlry and finally her long heavy green wedding pote. Lastly S gets a ring. I guess the men don’t get as much “bling” as the women. At last! Married... although there are still several more parties, rituals and ceremonies left to complete! While S poses for pictures, R’s cousins steal S’s shoes. 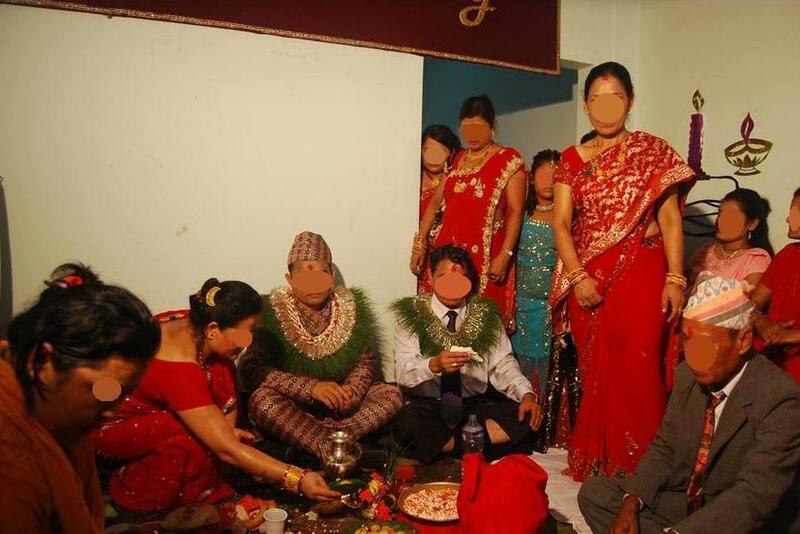 Since the wedding area is set up like a Hindu temple altar, the couple have to remove their shoes for the ceremony, making the groom’s shoes an easy target for the Nepali wedding tradition of the bride’s sisters stealing his shoes. The groom is not able to get the shoes back until he pays enough money to satisfy the sisters. S kept giving 100 rupee notes to try and get them back, but R’s cousin kept saying, “more! more!” and he eventually had to pay 5,000 rupees, about US$80 to get them back. By the time the Swayambar was over it was around 4 in the morning. Those who stayed at the wedding found a place to sleep for a few hours before the next ceremony began… around 9am! Prior to the “actual” wedding (Swayambar), P and I were hanging out with the bride’s family and watching the bride’s family’s preparations. But S’s family had lots of prep happening back in his home as well. One reason we didn’t get to visit with him during the prep stage was because S’s family is from a city outside of the KTM valley– a four hour hair-pin-turn-winding car trip up and out of the valley and down to the “terai” or the flat plains that border India. S's family prepare to send S, his father (sitting right of S) and a few family representatives to Kathmandu to bring the new wife home. 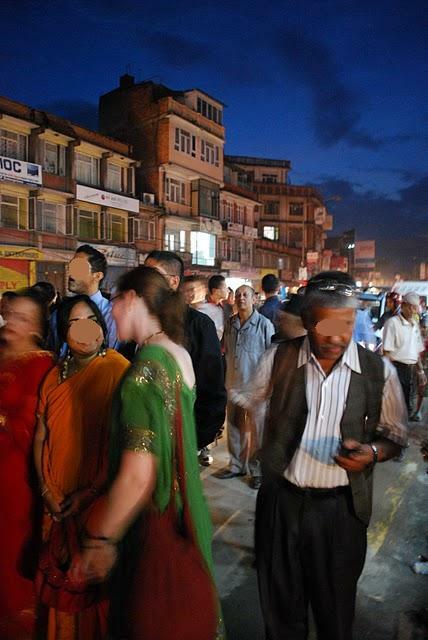 The entire family did not accompany S to his wedding in Kathmandu. 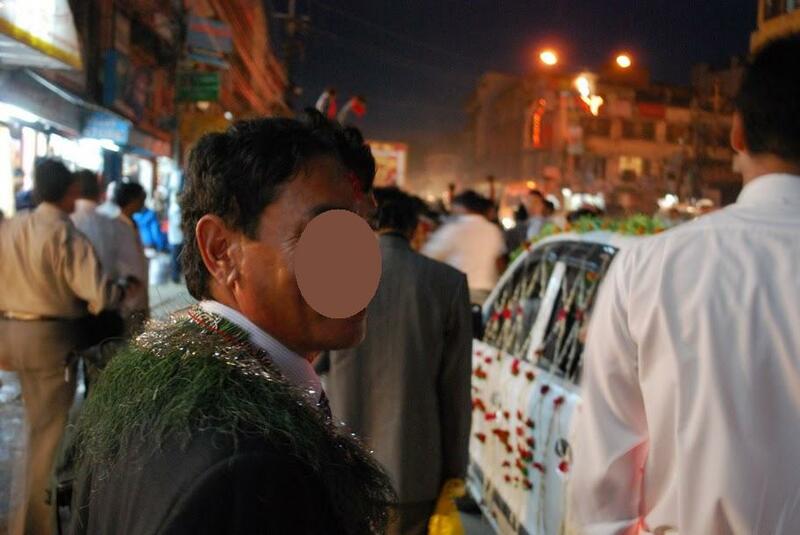 Only his father, and a few family representatives– an uncle, some aunties, some cousins– were sent with the groom. That meant that his mother didn’t have a chance to attend S’s actual wedding. She had to stay home and prepare the house for the arrival of the new bride. 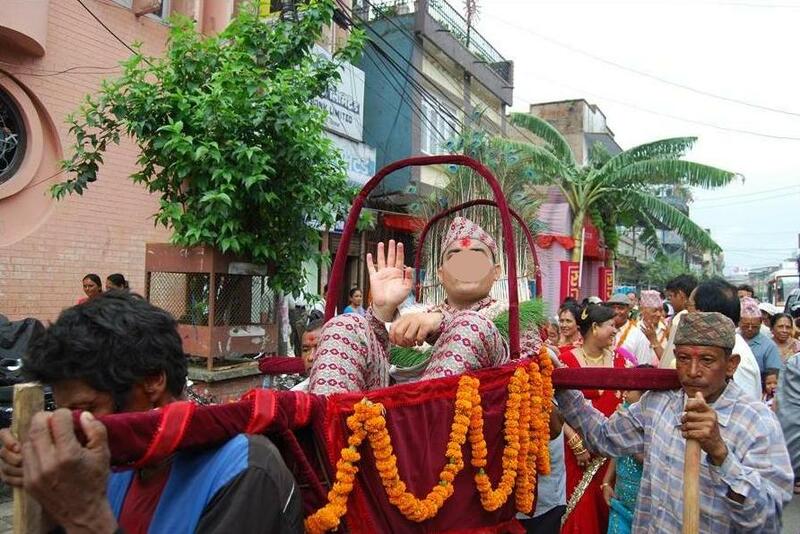 The groom’s procession known as the “janthi” left Chitwan early in the morning. After S’s already long journey from the stifling hot and sticky terai, P and I met back up with S a few blocks away from R’s house in KTM. The janthi (groom’s procession) congregated under a tent (with snacks and drinks, of course) before heading out in a noisy, chaotic, traffic clogging parade to the bride’s house. I was teased because I kept hopping back and forth between the groom’s side and the bride’s side (someone said, “who are you representing… pick one and stick with it”) but I was having too much fun. S's aunty puts a finishing touch (tikka) on S before the janthi set out on it's final leg before arriving on the bride's doorstep! 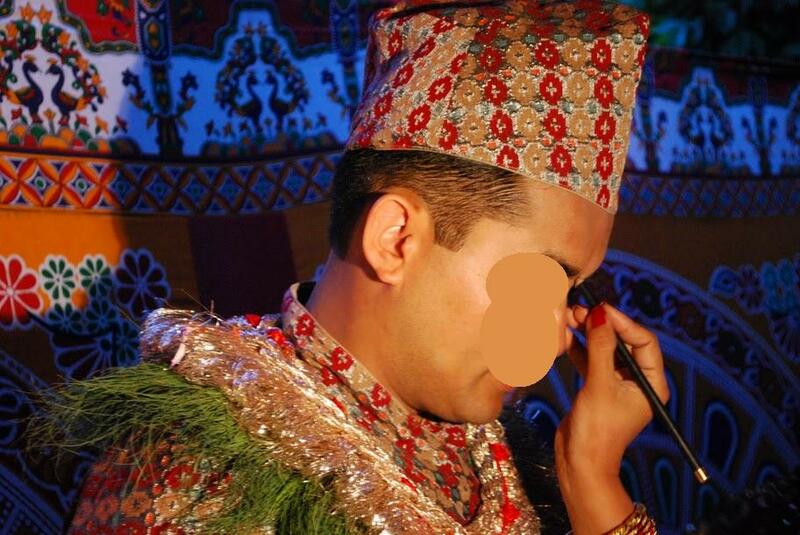 In the picture above S is wearing the traditional male wedding outfit. The fabric that he is wearing (dhaka fabric) is handwoven and very specific to Nepal. He is also sporting a Nepali topi (hat) that men are suppose to wear for special/formal occasions as well as for official photographs (such as a national id photo). 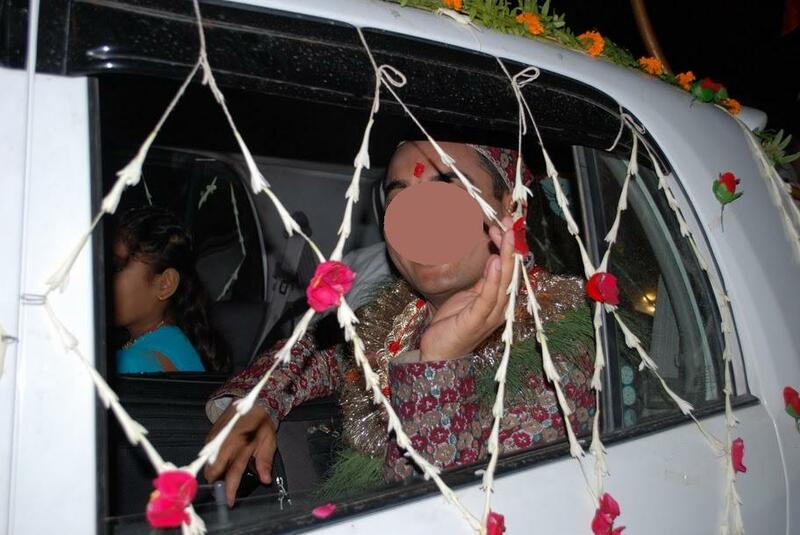 After an aunty applied the finishing touches, S was loaded into the flower draped groom’s car to anchor the janthi procession. 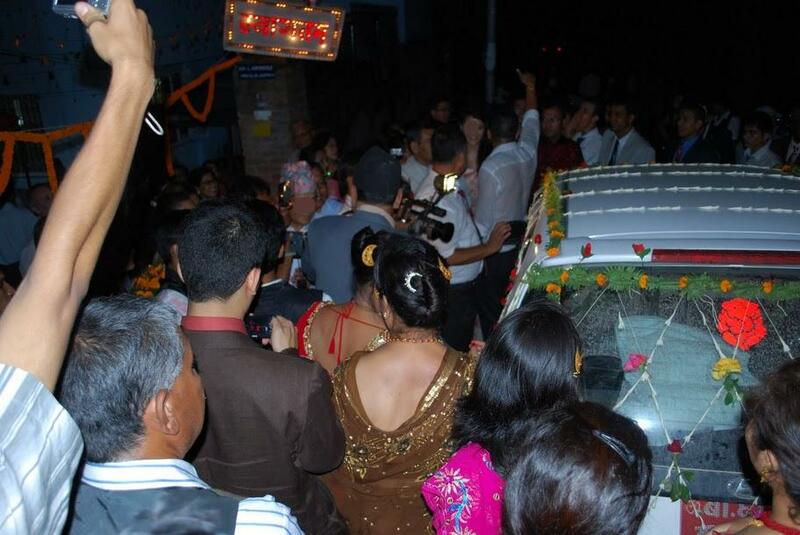 I guess one way to feel like a rock star in Nepal is to be a groom arriving janthi style! The janthi arrived and was welcomed by the bride’s family and friends. 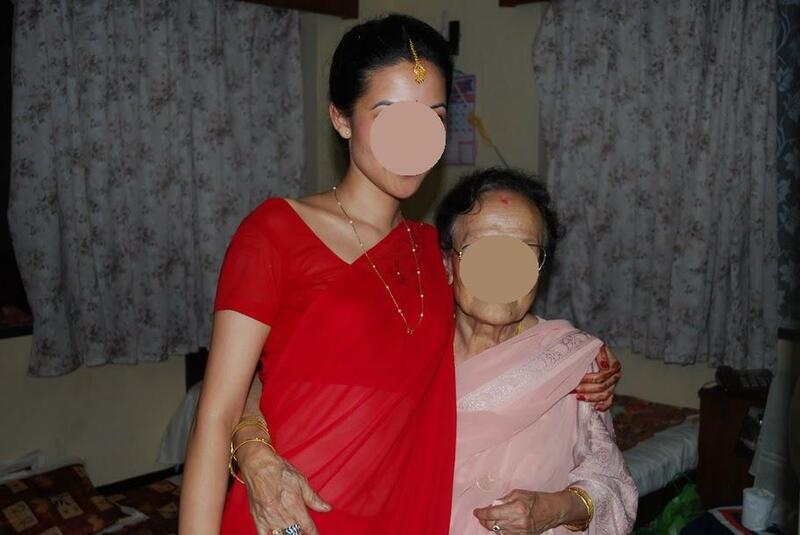 The bride, however, was tucked away inside the house with her grandmother, aunties and cousins. 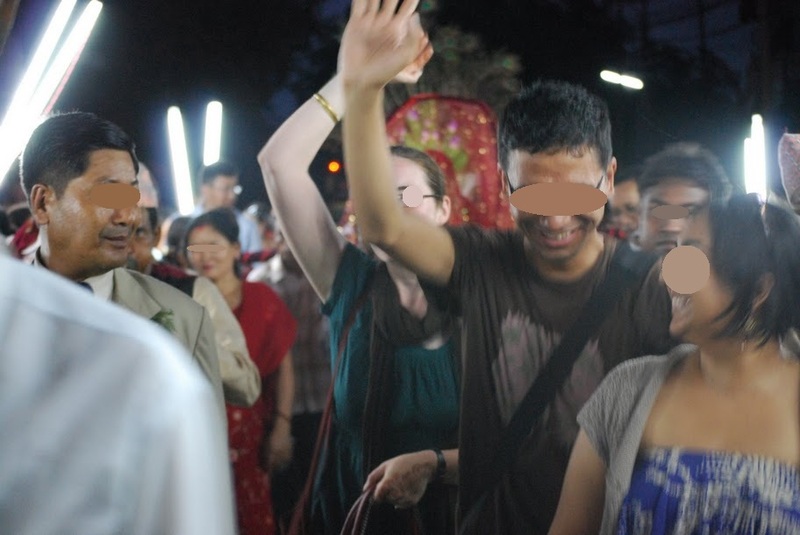 She wasn’t allowed to see the groom until the start of the “actual” wedding– the Swayambar. The date and time of the swayambar is set by an astrologer based on the bride and groom’s star charts. The most auspicious timing for R and S was 2 o’clock in the morning! It is at that time that the groom puts the sindoor on the part in the bride’s hair and the couple is officially considered married. So after dinner, those who were not willing to wait until the wee hours of the morning for the rest of the ceremony departed for home. P and I were among those who hankered down to wait for 2am to arrive. P and I missed the Supari, but since we planned to be around for the rest of the ceremonies, we didn’t think it was too big a deal. At the time we were still on our Solukhubu trek, but things became tense when we got stuck in Lukla and I was worried we would miss larger chunks of the wedding. 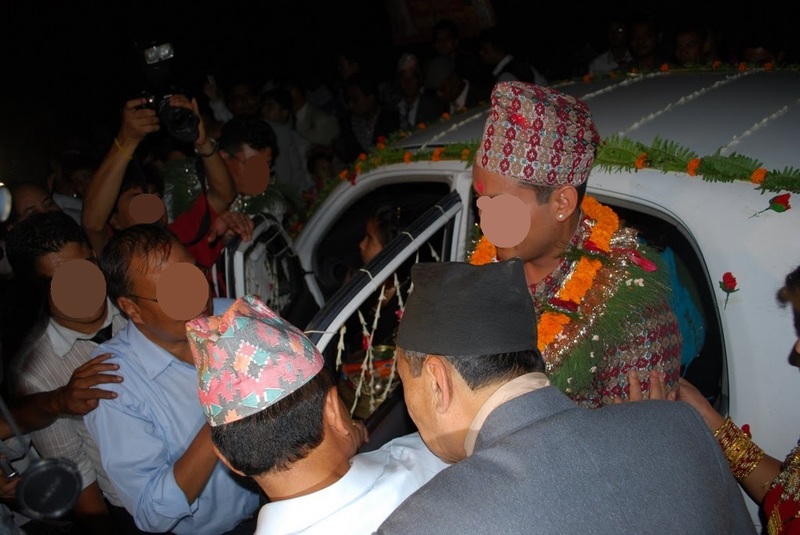 The Supari (as it is known in Newari culture) is a type of engagement ceremony, or at least a formal announcement/acceptance of the relationship. 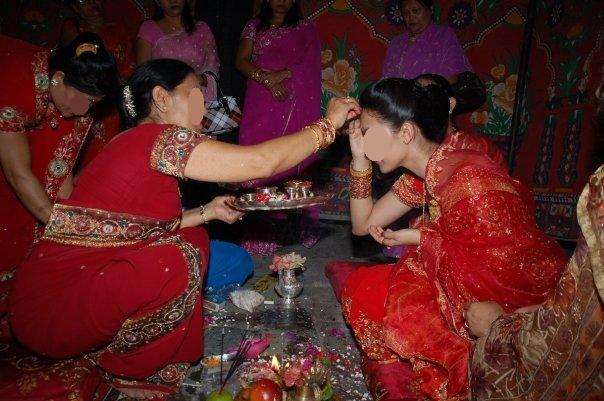 The bride’s family isn’t able to proceed with any of the wedding parties until the supari has occurred. 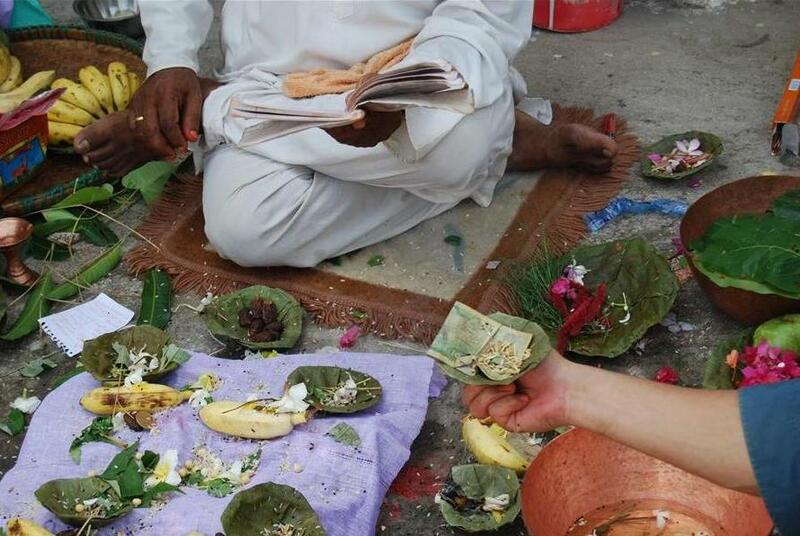 Supari is the Nepali word for betelnut, and the ceremony bares its name because the nut has a central role. The groom’s family travels to the bride’s family for the first time, bringing gifts (we will see these gifts again later). Traditionally they brought 4-6 betelnuts in little pouches for the family as well as sindoor which is used during the “actual” wedding ceremony (swayambar), although now more gifts have been added over time in addition to the betelnuts. The bride’s family provides refreshments while the groom’s family gives the gifts, and the bride is essentially sitting pretty so the groom’s family can check her out. Interestingly enough the groom is not allowed to come to this ceremony at all. Poor S spent his evening sitting out in the car during R’s supari since he wasn’t able to be part of the ceremony, until a friend came along and took him out for a beer. 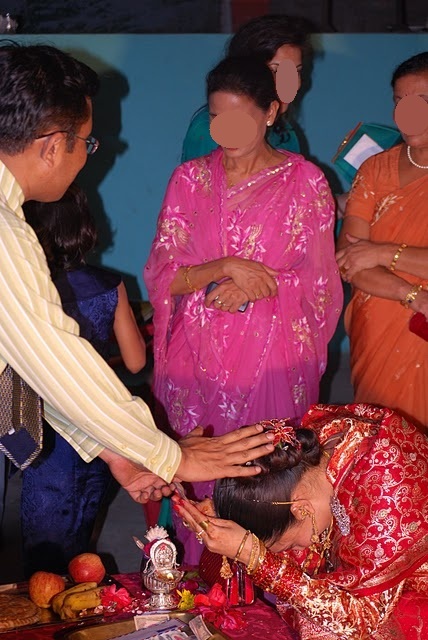 S's mom gives R blessings (tikka) during Supari. 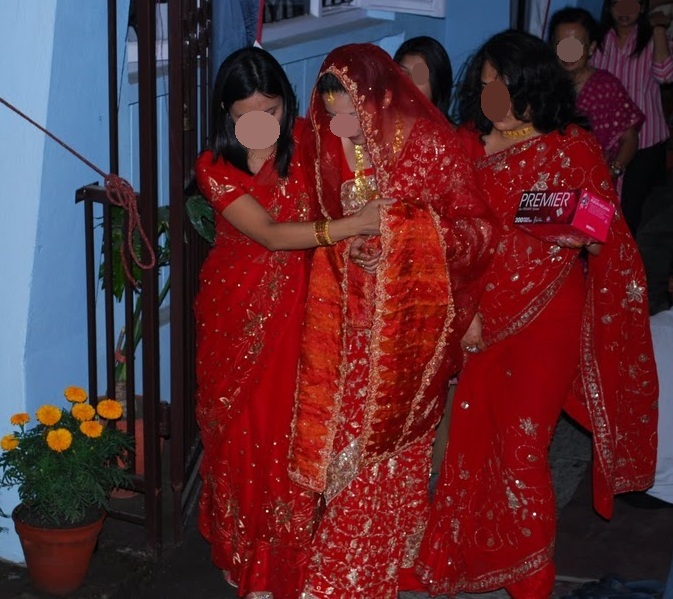 During the entire wedding process (days and days) R could only wear clothing in shades of red. 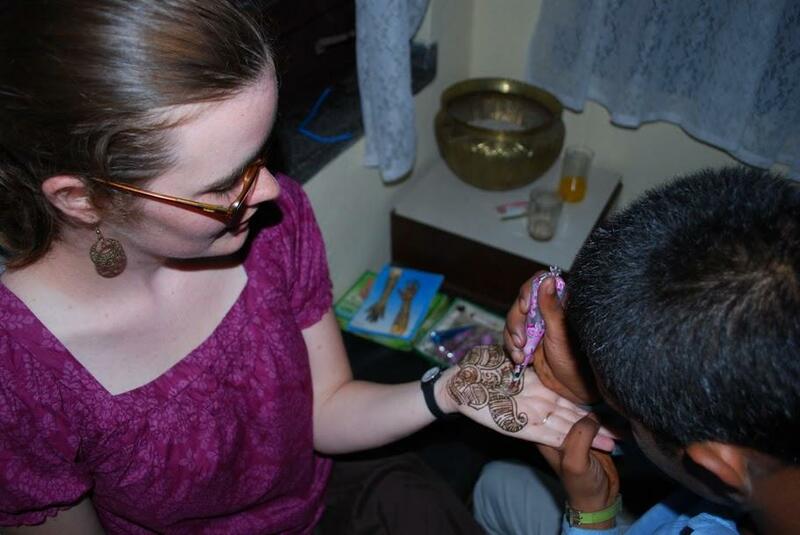 A few days after the supari… and luckily once we returned from Lukla, R decided to have some cousins and aunties over to put henna on our hands. 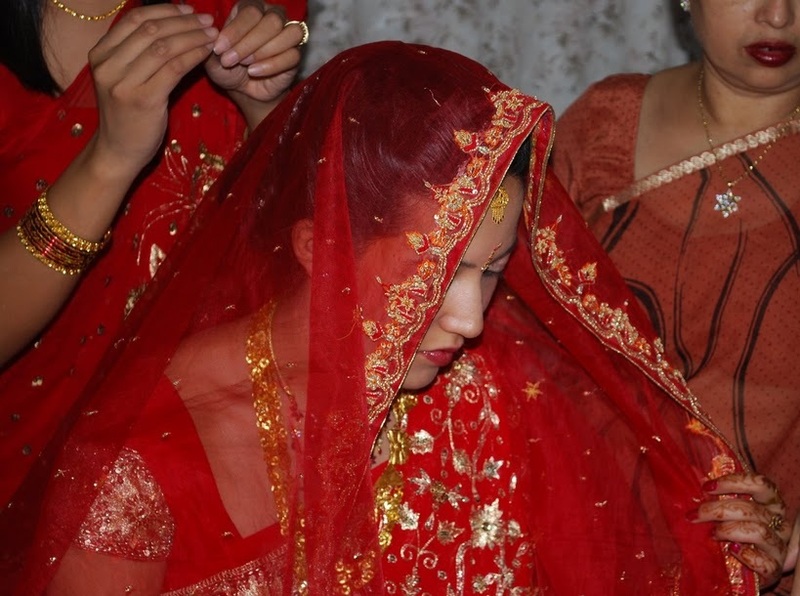 Bridal henna is not a Nepali tradition, and isn’t traditionally part of the wedding preparations as it is in many parts of India, Pakistan and Bangladesh. 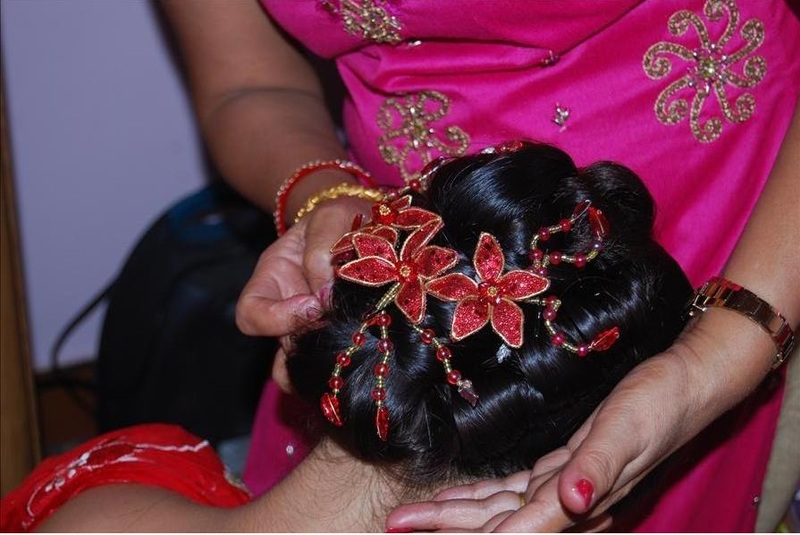 However Nepali brides are starting to use henna because of pop culture influences like Bollywood. I wanted to do it too, even though P’s family seemed confused as to why R was having this done. While we were getting our hands henna-fied, R’s brother and cousins were helping to fold hundreds of invitations. 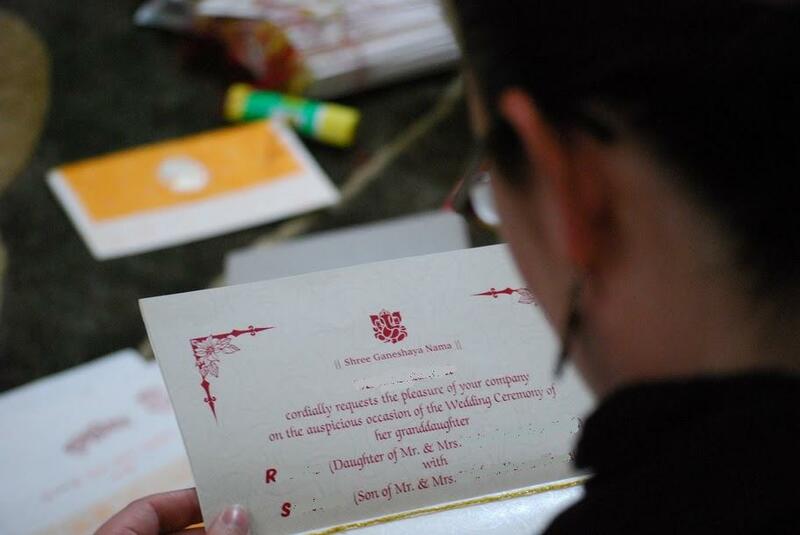 Most of these invitations are hand-delivered a few days before the ceremony. The invitations are organized into bundles and given to various friends and family members who know others and they spread through the community it that way. The Henna Evening was a nice way to get to know the bride’s family before the formal wedding began. 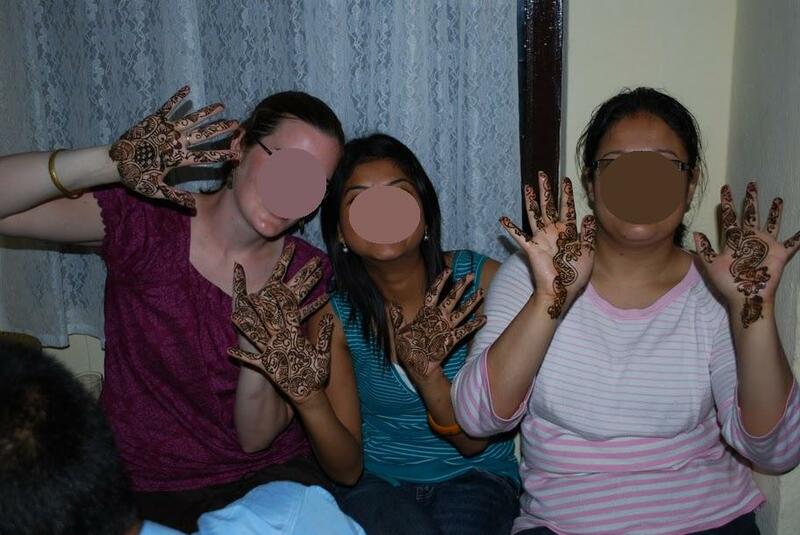 The women bonded, and during the wedding itself it felt like we had a special code… occasionally I’d flash my henna-ed palm at one of R’s cousins or aunties, and they would flash it back like a secret greeting. Shortly thereafter R’s family had the bride’s reception. Both the groom’s family and the bride’s family have wedding receptions, but the difference is that during the groom’s reception the couple is already married and both the bride and groom are present. However the bride’s reception occurs before the marriage ceremony (probably because traditionally the bride is married away into another family, so the bride’s family has to have their party before she leaves)… and since the bride and groom don’t traditionally meet before the “actual” wedding that means the bride presides over the reception without the groom. She sits on a platform at the front of the reception while friends and family come up to congratulate her and bring gifts. The thing that is probably most shocking to the average American is the number of people that attend these various receptions. Average American weddings are around 100-150 people. 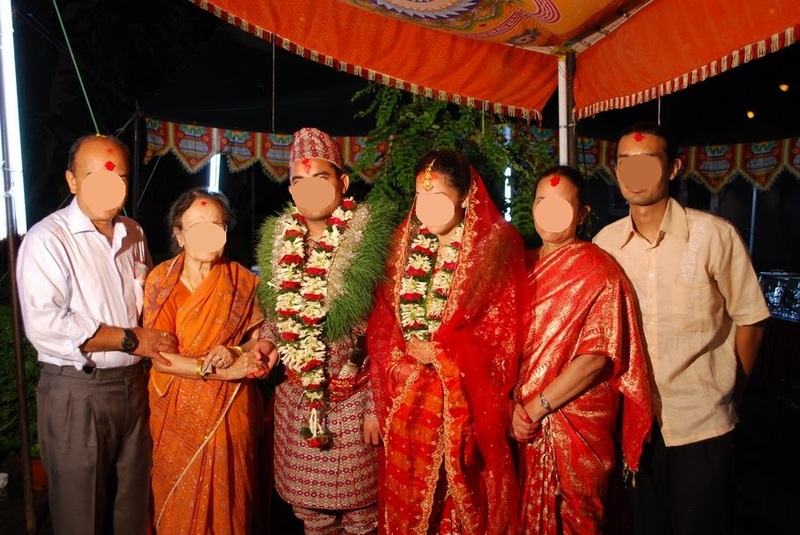 Average Nepali weddings have hundreds more– between 400-600, and remember there is more than one party! The sheer numbers are a bit boggling. One friend’s brother had 1200 people. Can you imagine? Yesterday R and S celebrated their one year wedding anniversary. That means a year ago today I was deep into a weeklong procession of activities (in sticky hot pre-monsoon, then monsoon, Kathmandu and Chitwan weather) to honor our good friends and their union with each other. 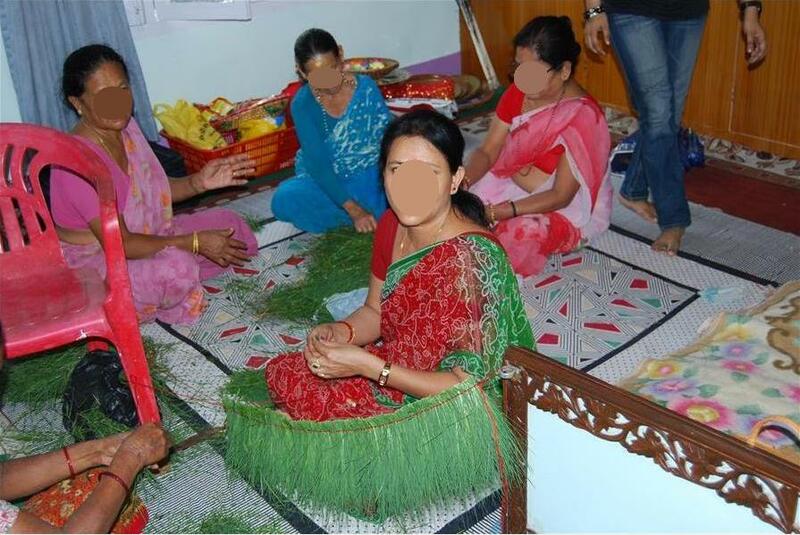 Since summer is wedding season, I figured it was about time to write about what a traditional Nepali wedding looks like. 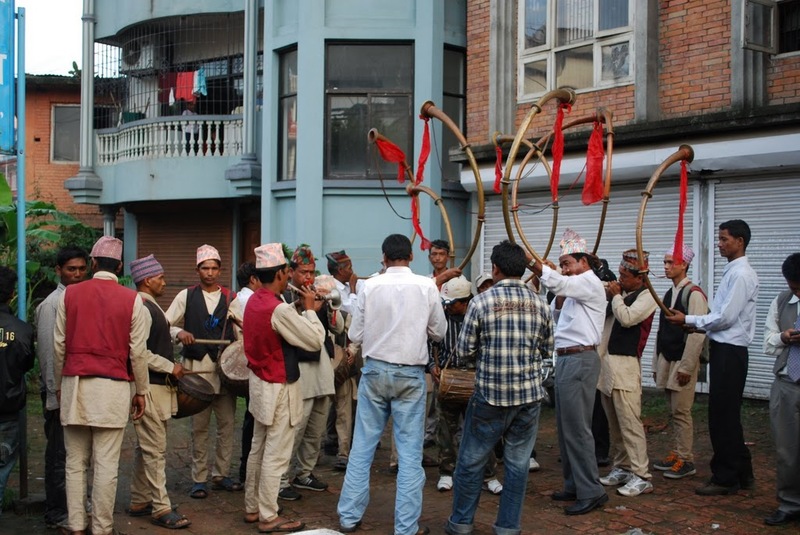 Our friends are Newari, so some of the wedding details are specific to Newari culture, but it gives a good idea of how big of an event a wedding in Nepal can be. All of this happened over the course of 7 days. So stay tuned, you’re invited to the story. I look at R and S's wedding invitation. 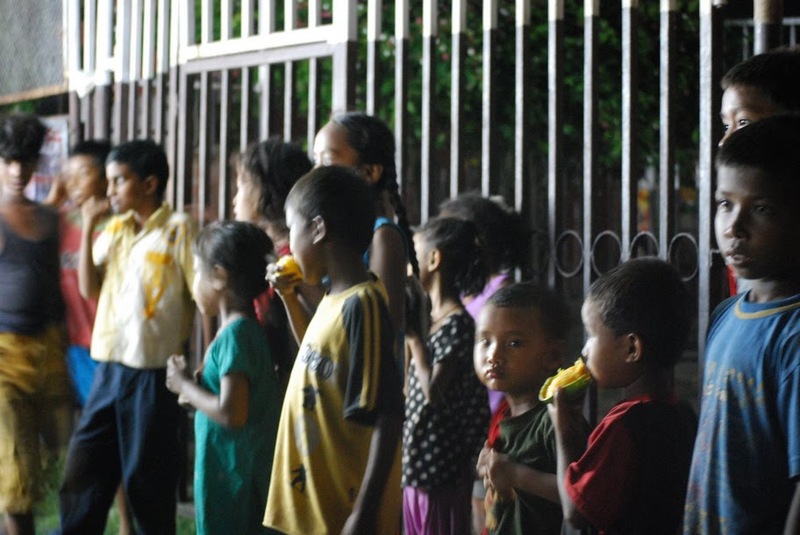 Most were in Nepali but luckily they had a small number of English language invites! 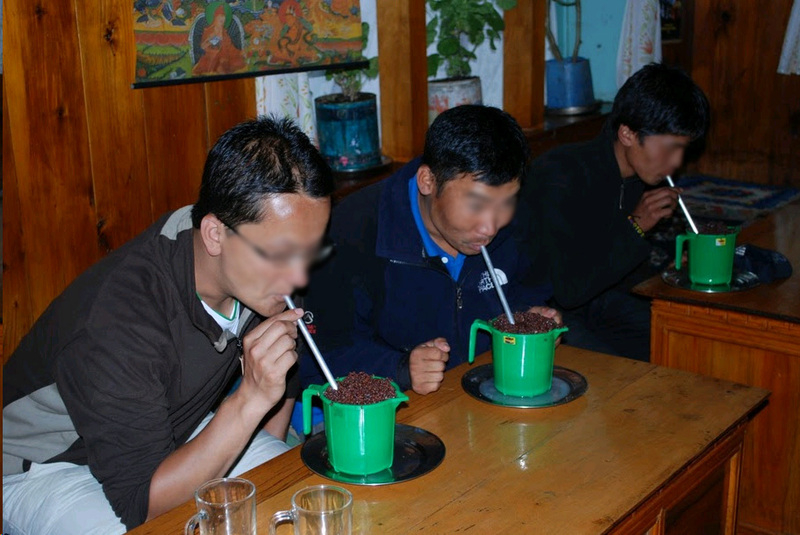 When we told some of P’s relatives (who had traveled to the Solukhumbu region before) that we were planning to go up to Lukla in mid June they thought we were asking for trouble. With the monsoon coming we were likely to be trekking in clouds and rain the whole time, and what was the fun in that? June is right at the tail-end of the trekking high season. Most people who plan to climb Everest do so in May when the weather is most likely to be clear at the summit, and so the climbers start their trek from Jiri or Lukla several weeks before that time. I half expected to see the trail a bit trashed, since I’d heard stories of the route being literally bumper to bumper with people in the high season, but it was peaceful, quiet and clean. We met up with a few people along the way, particularly a few news crews covering a Sherpa/climate change festival in Khumjung, and eventually we ran into these characters again when we all got stuck in Lukla. Our trek (which I’ll talk about later) was great, and we were really lucky with the weather, but on the last day or two as we were returning to Lukla it was cloudy and misty with a bit of rain. 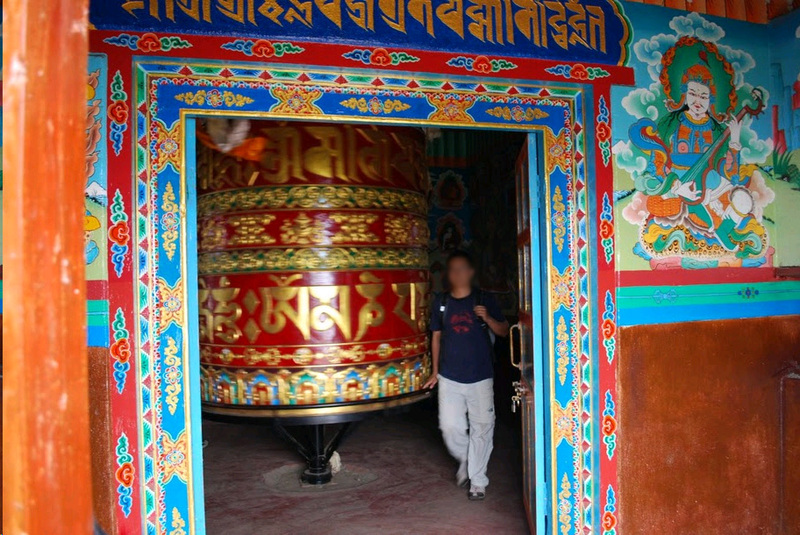 As we spent our last day walking towards the airport-town we were hopeful (and spinning every Buddhist prayer wheel along the way for good luck) that we would be getting out of there the next morning as planned. 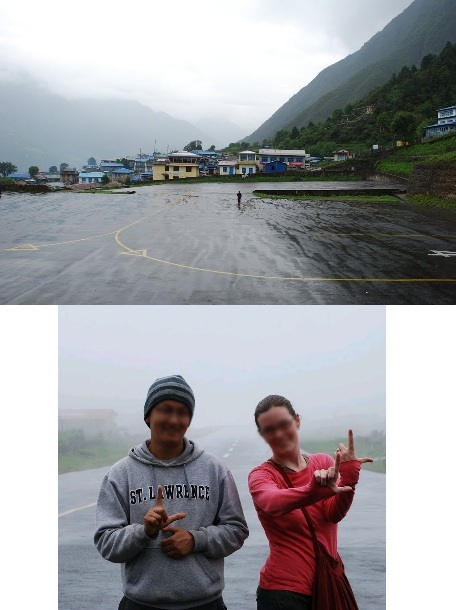 Little did we know that there hadn’t been any flights from Lukla in days. We reached our guest house, which had a large room full of tables that served as both a dining room and a lounge. It had big curtained windows that looked out over the airport. We arrived off the trek route, a little tired, a little grimy and in need of a shower, but excited about our accomplished journey and ready to return to KTM. P and I had a wedding to attend in a few days, and our friend had to catch an international flight. And then it started to pour. I peeked behind the curtains and saw the fog was thick as gray soup. A bit disheartening. We were still hopeful though. You have to at least try, right? So we ate dinner, and spent the evening playing rounds of cards with our guide. We woke up early in anticipation of the flight, but when I pushed back the bedroom curtain the fog was even worse than the night before, as if our guest house was floating in a milky sea of whiteness. Our guide came to the door and said that it would be impossible to fly in this weather, so we might as well get some extra sleep and meet him upstairs in an hour or two for breakfast. Apparently how the flights work is that even if your flight is delayed, as long as you are flying out on the same day you were scheduled to fly, you still have priority to get out that day, but after your flight day has passed there is no guarantee, and you have to be on the ball with pressuring the airlines and jockeying for space and tickets at the airport. I was still trying to be hopeful that we would get out that day, but it rained so heavily, in my heart I knew it wouldn’t happen. One of the major issues with flying to Lukla is that the narrow valley and challenging landing situation (one aviation site commented on the airport’s short 450m runway with 12% incline, and the ridges and landscape one has to clear to make it on the runway in addition to the special maneuvers a pilot has to do to land the plane—backwards thrust on propellers, etc., making it particularly tricky. The site concluded by saying, “If this is worrying you, one comforting thought is that only the most experienced pilots in Nepal are flying to Lukla.”) so pilots can only fly when visibility is clear enough to make a smooth landing since everything is done by sight rather than with sensors and GPS. Some attempts have been made in the past for flights to land in foggy weather and the outcome has not always been good. 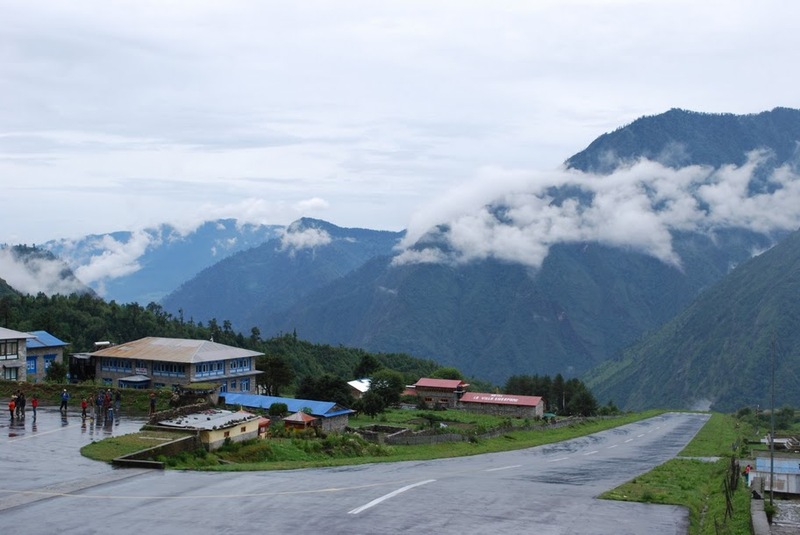 In 2008 a Yeti Airlines flight crashed just short of the runway, killing 12 Germans, 2 Australians and 2 Nepali tourists and the memory of this crash is still very fresh in the minds of Lukla dwellers. When tourists start getting antsy and harass the airport officials they are gently reminded that after the Yeti crash, pilots have been more careful and strict about flight conditions specifically for their and for their passengers safety. The Lonely Planet guide says that flight cancellations are common and that the writers have personally witnessed some bizarre things at the Lukla airport, such as people going completely hysterical, pulling knives on airline staff, getting into fistfights, trying to bribe everyone, etc. I can really see how people might go crazy in this situation. Imagine that you’ve been trekking in the mountains for weeks, all your clothes are filthy, you are desperate for fresh fruits, vegetables and other foods and comforts you’ve been deprived of for weeks, and you are running out of cash and stuck in a town with no ATM. Maybe this is why there are so many policemen and soldiers at the airport: to prevent desperate stranded passengers from stampeding the planes when they finally do arrive. The thing is, being in Lukla really reminds you of how isolated you are. If you are stranded, the only alternative you have besides waiting for a flight is a 5+ day arduous hike up and down some steep valleys to get to Jiri where you can either catch a flight (if the weather is good) or a bus to KTM (which is another full long day on the road). Not to mention, in the past the Jiri-Lukla trail was a common place for Maoist guerillas to ask for steep “donations” from tourists (if you didn’t pay they turned you around and forced you to go back—this isn’t the case anymore, but it was a few years ago, and my dated Lonely Planet guide had a lengthy section on this). It winds up being a tough decision whether to stay or to go… because at any moment the sky might magically clear and the flights can come from KTM (it only takes ½ an hour) and then you are back in the capital again. You either wait seemingly indefinitely for that magic window, or you take your chances on the 5+ day hike and know you can make it out of there. As we sat in the guest house lounge (ultimately we were there for three days) this was a common topic of conversation. Everyday more people arrived at the guest house and the group hanging out in the large lounge grew, and everyday people were missing international flights (even our friend had to reschedule). We were already missing the first wedding event for our friends, and I fretted about missing the rest of the wedding. If we walked to Jiri for sure we would miss their wedding, all we could do was wait. That was the worse part. The uncertainty. You could easily be there only a few more hours, or a whole other week. Our third morning the weather looked the most hopeful. It was still cloudy, but not as thick, and it looked like the clouds might lift. We quickly ate our breakfast and ran off to the airport (which is practically the middle of the town, so it is pretty much the center of activity). Others had already started gathering. Our guide grabbed our tickets, we went through the quick security check, and sat in the small waiting area. Eventually a siren was blown and we saw a bunch of people from town start streaming towards the airport. Our guide explained that when flights had been stalled for several days the airport blows a horn to let the town people know a flight left Kathmandu. It meant that in ½ hour a flight would arrive. The mood at the guest house was absolutely dismal. Then it started raining the hardest that we had yet heard. There was no point looking out the windows, and the curtains were drawn shut to keep out the clouds, rain, and stave off depression. Our guide ran back to the airport to bring our bags since word got out that the weather was so bad they decided to close the airport. I ordered and ate my fried chowchow noodles for lunch. Another hour went by… more card games, finished another movie. Then the mother of a stranded Indian family on holiday looked out the window when she noticed the rain had stopped. The sky was surprisingly clear, as if the heavy heavy rain lightened the clouds and they had risen above our altitude. Like MAGIC the clouds lifted and they brought in a few flights. We got out while we could. We grabbed our bags and ran back to the airport that was slowly reopening. Another siren, more commotion and then… the sound of a twin otter engine! A flight landed! It actually landed! It was beautiful, people cheered, dried their tears, and hopped more flights would come. We had tickets for the second flight of the day, so we watched anxiously as the first flight unloaded passengers and supplies for the town, then watched as the first haggard looking group of stranded hikers climbed on board and took off. A few minutes later another humming engine could be heard, and our flight landed! We ran out to the tarmac ready to jump on the plane, almost too impatient to wait for the arriving people to get off the plane first. As I climbed aboard and settled into my seat I could see the girl who snort-laughed at us when we talked about leaving on the first day. She was still sitting on a step outside the airport door. Hopefully another flight came that day, the weather was so unpredictable it was hard to tell. I was so excited to fly back to KTM and not to miss our friends’ wedding that I wasn’t even nervous about the take off, even when our guide said, “If the pilot misses it is just village, then rock, then water” (meaning our plane will careen down the cliff edge and smash into the valley and river below). Minutes later we were airborne. Flying again through the majestic valleys and out of the clouds. The guide pointed out the path to Jiri. It looked steep and challenging, and I thought about the woman slowly making her way along the trail because she couldn’t wait anymore. Then we saw our first actual road, and more villages, in no time we were flying over KTM and landing at the airport. It is funny when you go from one very different place to another. When you land in the airplane it is almost like the place you were at before was a dream, because the issues that were all consuming—the weather, being stuck, not getting back to the city– melt away. Quickly you find yourself again absorbed back into the crowded, dusty, bustling city.